The transport bureaucracy underwent a war of ideas last decade between supporters of single deck and double deck trains, according to one of the author’s of the Sydney Morning Herald’s 2010 Independent Public Inquiry into a Long-Term Public Transport Plan for Sydney, Sandy Thomas, in a 13 page article called ‘Fixing’ the trains in Sydney: 1855 revisited. The metro advocates would come out victorious, according to Mr Thomas, and their advice has been accepted without question by Transport Ministers since, despite only representing one side of the debate. He further laments that this could lead to a repeat of the year 1855, when different rail gauges in different parts of Australia prevented a unified rail network, but this time with narrower and steeper tunnels preventing double deck trains from ever using big chunks of the current Cityrail network. Mr Thomas outlines the history that led up to this point, starting with the Metropolitan Rail Expansion Program of 2005, which would see the construction of the North West Rail Link (NWRL), South West Rail Link (SWRL), and a Second Harbour Crossing, as well as track amplifications from Chatswood to St Leonards and Redfern to Campbelltown. Together with some existing lines, these would form an entirely new fast and frequent line in the network comprised of longer ten-carriage trains for long distance trips through to the North West and South West Growth Centres, operating independently from the rest of the network. It would increase CBD capacity by almost a third. Once built, all future lines would also be entirely separate, running independently, most likely with single deck metro rolling stock. Critics of this plan included some within the Transport Department who saw Railcorp as inefficient, led on by the Rail, Tram, and Bus Union, as well as those who were motivated by what Mr Thomas describes as “playing with new train sets”. These critics found support in the NSW Treasury – from which many staff of Infrastructure NSW would be drawn from later on – who also wanted an independent line that could be operated privately instead of by Railcorp. Together, these public servants convinced the politicians to dump the MREP and instead immediately build a new series of metro lines. Mr Thomas explains that this was done by the presenting of selective details of each plan, rather than painting the full picture, and that politicians with little to no background in transport planning accepted these half truths as fact. 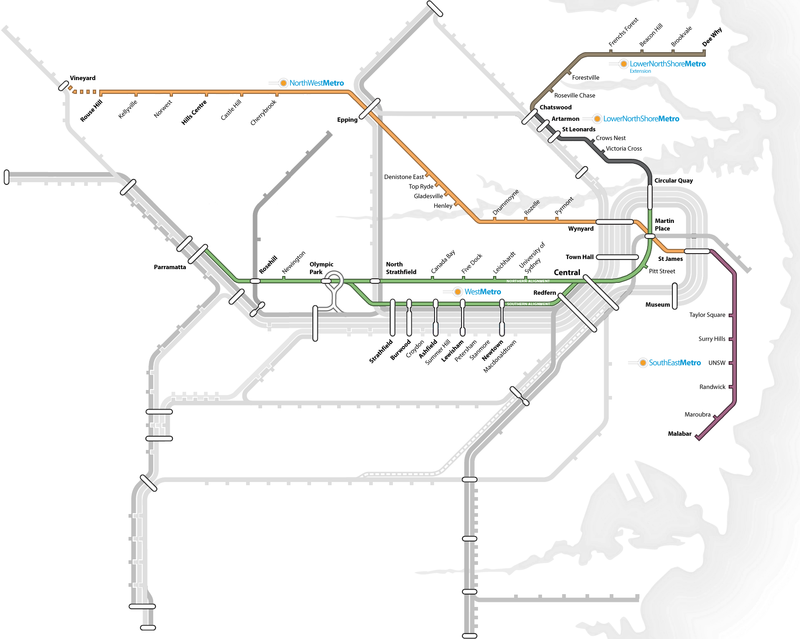 The first of these would be the North West Metro, which would take the existing NWRL and connect it to the CBD via Victoria Road, rather than the then still under construction Epping to Chatswood Line, in part to avoid an expensive Second Harbour Crossing. Mr Thomas points out that while this new line provided Victoria Road with a rail line, it bypassed the jobs rich corridor of Macquarie Park, Chatswood, St Leonards, and North Sydney. This was planned to be only the first of a number of new metros, including metros to the Northern Beaches as well as under Parramatta Road and Anzac Parade. However, a lack of funds resulted in it being contracted to “CBD Metro”, going out as far as Rozelle, only to be abandoned altogether in 2009. The government returned to something broadly resembling the MREP: the NWRL and SWRL, but replacing the Second Harbour Crossing with a “Western Express”, which would allow fast trains from Sydney’s West to continue through to Wynyard via a “City Relief Line” under the CBD. A promise of funding from the federal government also added the Parramatta to Epping Rail Link (PERL) to that list of projects. A change of government in 2011 saw the incoming O’Farrell government keep and prioritise the NWRL and SWRL, while deferring and eventually dumping the Western Express and PERL. Meanwhile, inside the Transport for NSW, a new plan was designed to convert part of the existing network to single deck metro trains, including the existing Harbour Crossing in an attempt to avoid building a Second Harbour Crossing. 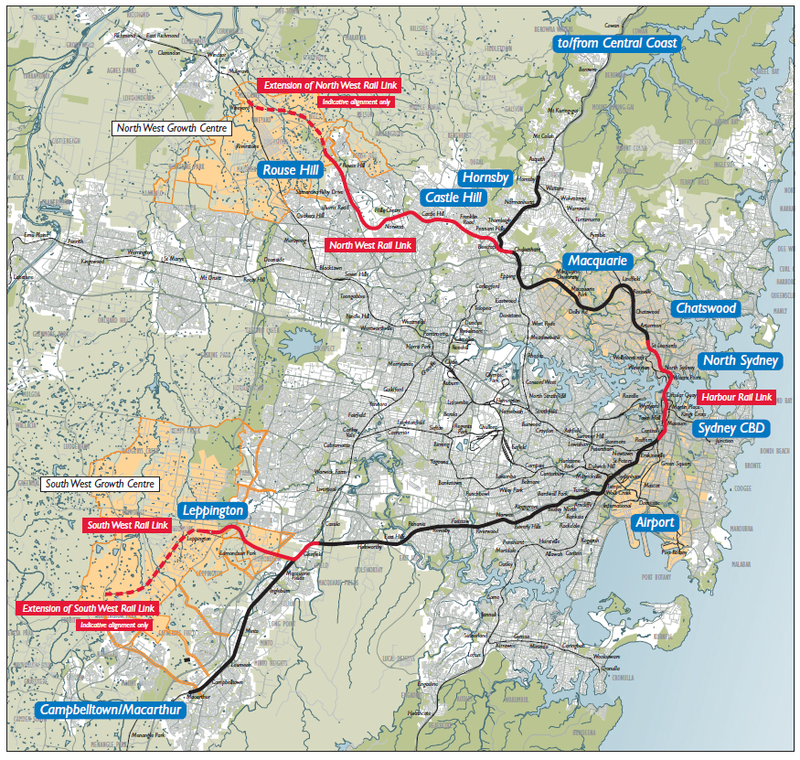 This plan was leaked to the media, and consisted of the NWRL and North Shore Line to the North as well as the Inner West Line, Bankstown Line, and part of the Illawarra Line through to Hurstville (utilising a second pair of tracks between Sydenham and Hurstville). Mr Thomas explains that this plan was prevented from getting the green light because it would be unable to handle 28 to 30 trains per hour, as previously believed, and therefore not provide the additional cross Harbour capacity that it promised. It too, would be abandoned (though while still in the planning stages), and plans for a Second Harbour Crossing were once again put back on the table. Uncertainty remained. Mr Thomas points out that while Transport for NSW opposition to a new double deck line integrated into the Cityrail network was shared by Treasury, and now also Infrastructure NSW, that this did not extend to large scale expansion of the rail network. Instead these were “advocates of greater spending on motorways rather than public transport, including Infrastructure NSW supremos Nick Greiner and Paul Broad, [who] were actively ramping up their efforts to kill off any form of the North West Rail Link project” (Sandy Thomas, ‘Fixing’ the trains in Sydney: 1855 revisited, page 4). As it were, Infrastructure NSW did endorse the NWRL, most likely due to pressure from the government, but opposed the construction of a Second Harbour Crossing, instead suggesting the government opt for the previously rejected metro conversion. Transport for NSW instead suggested a Second Harbour Crossing in addition to, rather than in lieu of, a metro conversion. The government sided with Transport for NSW. This plan, known as Sydney’s Rail Future, included a modified version of the NWRL with narrower and steeper tunnels, too small to fit existing double deck trains and too steep for them to run through even if they did fit. It is here that Mr Thomas makes not so much his main criticism, but almost a plea to the Transport Minister. His concluding remarks are replicated below in full. “But there’s one simple step that NSW Transport Minister Gladys Berejiklian can and should take immediately: veto the lunatic attempt by her bureaucrats to quietly create a multiple “loading gauge” rail network in Sydney through the specification of unnecessarily small and steep tunnels on the North West Rail Link. If Ms Berejiklian does this, she’ll be rightly remembered as the politician who took less than a year to unravel the loomingmess ofmultiple gauges in Sydney. In comparison, that first “expert” multiple gauge decision in Sydney, in 1855, is still creating problems around the nation 158 years on. How is it that one Australian community is creating gigabytes of words discussing the NBN and another community is doing the same thing with devising more ways of squeezing more people over shorter time frames in and out of the CBD? The CBD is an area which no one can make any bigger given the existing road alignments and the constraints of Darling Harbour, Circular Quay and the Botanic Gardens? The time is overdue to hold all these discussions in the context of the following fundamental questions. Do people want to travel long distances at considerable expense to cluster together in a small area? What do they do when they get there? Has not digital technology moved on since 1855 such that it is now possible to move data in vast quantities and minimal cost once the infrastructure exists. Is it not better to move (satellite) work places (or encourage them to expand) along (rail) transport corridors, instead of building more corridors which, in the case of road corridors, quickly fill? Why do we keep making the same expensive mistakes when we are no longer constrained by the ability to move data instead of people? Telecommuting is definitely something that should be encouraged, where possible, and hopefully the NBN will allow more people to do it than is currently the case. I question whether the CBD cannot continue to grow. It has grown both outwards (past even the limits outlined in the previous comment) and upwards. And keep in mind that working in physical proximity brings huge benefits to certain types of jobs, particularly in the knowledge and creative industries. Remember that the CBD (depending on where you put the geographical boundaries) accounts for only around 12%-15% of Sydney’s jobs. So just as there are jobs that are quite suited to telecommuting, there are some that aren’t. For this, we will always need a CBD. The old interstate, multi-gauge issue was the first thing to come to mind when I heard they were making special tunnels just for the North-West Rail Link. This just doesn’t make sense for an integrated network. Too many vested interests or just silliness? It’s partly the desire to ensure that the new line remains isolated from the rest of the network, making it compatible with double deck trains means a different government or transport minister could integrate it into the existing network quite easily. Whether or not that is a good idea depends on how strongly you support a line run independently of Railcorp (which some do see as a positive game changer). The other motivating factor is cost. Narrower and steeper tunnels would be cheaper, particularly when it comes to the building of a Second Harbour Crossing and new line under the CBD next decade. Those two things don’t necessarily outweigh the problems of forever banishing double deck trains from the new line, and I personally would rather see them made compatible with double deck trains. But there are legitimate reasons to consider the alternative. The great tragedy is that Sandy Thomas’ paper has not, so far, received much broader media coverage, although as I understand it, it was only released last week. One can only hope that the metropolitan daily’s are analysing its contents and will express their opinions in coming days. As someone who has insider knowledge of how the transport bureaucracy operates, he paints a disturbing picture of how certain elements within the network development division have gained ascendency by fudging research analysis and suppressing opposing opinions to justify their agenda to introduce metro style single deck operations to the North West Rail Link and later to extend it to other parts of the CityRail network. As Gavin Gatenby of EcoTransit points out in his excellent critique of the current NWRL plans, one of the principal protagonists in all of this is Rodd Staples, no doubt aided and abetted by his Director-General of Transport for NSW, Les Weilinga. How these two transport bureaucrats in particular have been embraced by the new Liberal government beggars belief, when they were behind the failed metro projects, including the disastrous CBD – Rozelle Metro, proposed by the previous Labor government. You would have thought the new government would want have started with a clean sheet, but why they persisted with these failed bureaucrats is beyond my comprehension. Perhaps they were too naïve by trusting in their bureaucrats or they had a similar agenda from the start. Even more disturbing is the release yesterday of the Response to Submissions Report for the NWRL EIS2. 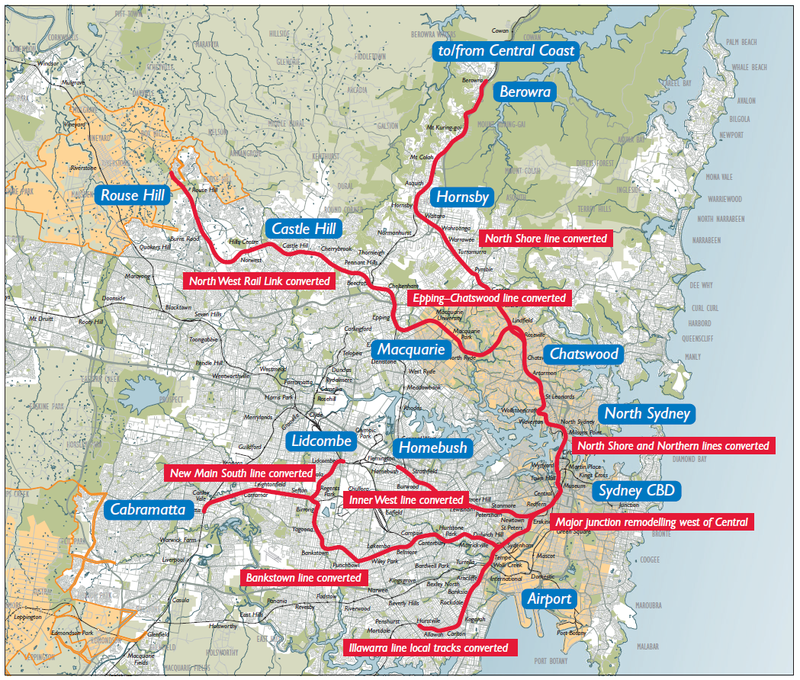 The submissions received (over 300) were overwhelmingly unsupportive of the current plan, particularly in relation to its operation as a rapid transit system (metro or whatever you like to call it), its truncation at Chatswood to what was previously promised, the narrower tunnel loading gauge, the effects on the existing operation of the Northern Line from Hornsby to Epping and issues about bus access to the proposed Cherrybrook Station. The report failed to directly respond to most of these concerns. For example, with regard to the narrower loading gauge in the tunnels, the response was that “Section 2.5 of the EIS 2 describes Sydney’s Rail Future: Modernising Sydney’s, which was released in June 2012, and is an integral part of the NSW Long Term Transport Master Plan…… blah, blah, blah”. It concludes – “Therefore, NWRL, will deliver the required infrastructure (including tunnels) to support single deck trains and advanced signalling. This is the same response that was given to every submission querying the appropriateness of single deck trains and narrower tunnels. No justification for making the NWRL, or for that matter future extension of the so-called Rapid Transit concept, incompatible with the rest of the CityRail network. 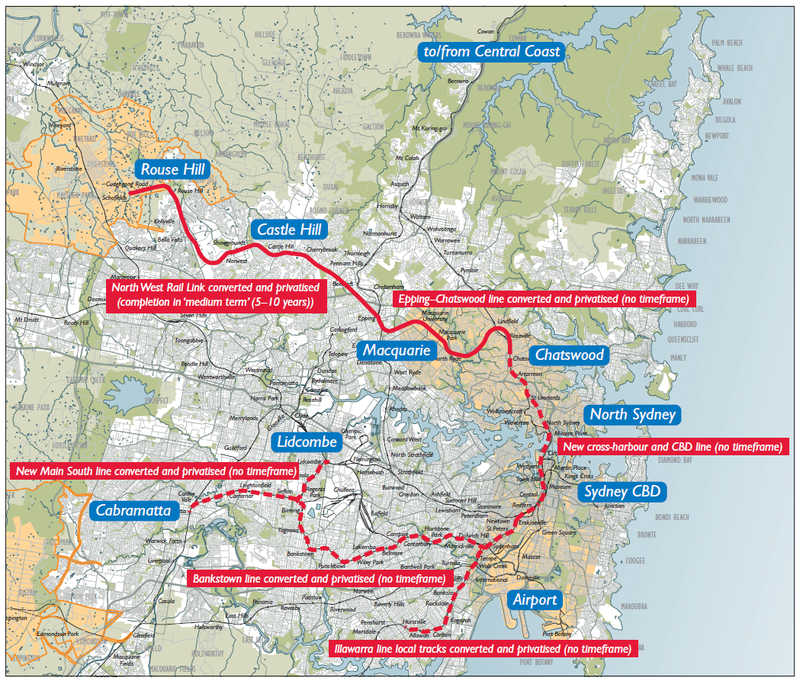 On the question of the future operation on the Northern Line north of Epping, which will no longer be able to access the Epping to Chatswood Rail Link, the response was that these services will travel to the CBD via Strathfield with increased frequencies. However, the report failed to disclose that with limited, if any, train paths available on the “Suburban” tracks through the CBD to North Sydney, some if not all of these services may have to terminate at Central. This report only reinforces the view that this government doesn’t give a fig about community consultation and they are determined to get their way, no matter what. They are no better than the last lot. I once had a lot of respect for Gladys Berejiklian, but in her failure to question the advice she is getting from her transport bureaucrats, she has shown, as far as I’m concerned anyway, she is not up to the task. Gladys, prove me wrong! To sum up, if she would take note of Sandy Thomas’ concluding remarks in his paper and act accordingly, then I would view her in a more respectful light. I really feel a rally of some sort is warranted to protest against these bloody unnecessarily narrow tunnels and maybe to kick the old dinosaurs out. And yes Jacob Saulwick or someone at SMH needs to see Sandy Thomas’ paper and let it be known to the world. Huge repeat of an old mistake (gauges and now tunnels)! Ash – Jake Saulwick did read it and he has written an article on it. Check today’s SMH. I am not advocating the abolition of the CBD and, of course, the CBD can continue to grow. But does the CBD have the scope of cities like London http://www.willpearson.co.uk/virtual-tour/shard-360-dusk/ which can and has grown in all directions? The question is: should the CBD grow and at the historical rate of growth, given technology has moved on and space is limited? Servicing ever longer commutes, when people expect to commute at the SAME time is expensive (e.g., a second harbour crossing). Should the assumed needs of “creatives” drive all our thinking? Like the obsession with dwell times is driving the design of trains? There was a time when stockbrokers clustered in the CBD because attendance at the Stock Exchange required it. Solicitors needed access to their law library and public records. These resources are now on line and the tools to manage paper files are improving. Even the law courts have moved beyond Queens Square. Has the current generation heard the term “Macquarie Street Specialist”? Limited bandwidth meant it was sometime faster to courier large files than send them electronically. Does it make sense to plan for cramming more people into the CBD when, with its generous car parking spaces, Macquarie Park was planned for and still serves a car based workforce? The planners dictate Epping already gridlocked with traffic from the north and west is going to be high rise residential (with parking) when zoning around the rail junction could be commercial with limited parking. First we need to redefine teleworking to include not just working from home to include working closer to home preferably in offices closer to rail ways. Telepresence is going to provide many of the advantages attributed to physical presence http://www.cisco.com/en/US/products/ps7060/solutions.html, but one never sees this issue discussed in land use and transport discussions. And if the CBD only accounts for 12 to 15% of Sydney jobs, why is there so much emphasis (including from the PM) on servicing that market? And if it is expanding outwards beyond its convenient walking distances, why not expand back into the suburbs closer to where people live? As to upwards, the roads and footpaths are somewhat constraining influences. Sandy has kindly re-formatted his excellent analysis to landscape http://goo.gl/EBtva making it much easier to read on line. Especially in full screen mode. The CBD has grown West into Pyrmont/Ultimo, it has also spilled over into North Sydney, and there are almost no limits to its Southern expansion. Meanwhile, Potts Point to the East is the suburb with the the highest population density in Australia. As to upward expansion, the CBD has continued to become more and more pedestrianised, with more floor space for pedestrians and less for cars. This also means more emphasis on public transport access into the CBD, rather than road access into it, which is why the CBD accounts for half of all journeys to work made on public transport and why there is so much emphasis put on transport access to the CBD. You are absolutely right about fewer people needing to be in close physical proximity, something which I agreed with you on in my previous reply. That is why the CBD now accounts for a smaller proportion of jobs than it used to. But there are some jobs that will always require some level of proximity to others, and that is why we still have a CBD. That’s encouraging. But this issue is still getting less news acreage than Julia@rootyhill despite having more long term impact.. While I can find it on smh.com.au, it does not seem to have made it to the iPad version where the public transport customers receive their news. Next stop 7.30 Report. Does anyone have any influence? It looks as if the advice about early birds is correct. Gladys Berejiklian has a twitter account but has never tweeted. Unlike Malcolm Turnbull who pretends to answer questions about Coalition NBN policy in Twitter and on his blog, she does not have a blog either, so far as Google knows. Perhaps she could be invited to respond to “policy by infighting” in this blog. I strongly agree with the gladys/les/treasury view and oppose sandy’s viewe. He skirts over why various people hate railcorp and the rail unions. He also skirts over why treasury might have grown tired over 150 years of throwing good money after bad. There is only one decent railway in nsw, it runs from bullocks creek to mt blue cow via perisher. It doesnt suffer union bloodymindedness. It doesnt have ministerial staff on the blower all day telling it what to do, or that old mrs jones doesnt like the non reversible seats. Sandys and the socalled independent fairfax ‘inquiry’, apart from being a big piece of racist tosh eg australians love ‘european’ systems not ‘asian’ ones, cue yellow peril and conical hats, also favours outer suburban travel over inner suburban travel. Sydney, despite the hysterical politics of the last week, actually has a high density core of 1 to 2 million people very poorly served by commuter trains and desperate for a mass transit alternative. The city is jammed with buses as a result. And the end of the day, double deck versus single deck is a furphy. RATP do a good job with DD. the aim is to get cityrail, its management, its staff, its union and its culture as far as possible from new asser investment as possible. -i thing the extremity of the line beyond rouse hill is overkill at present. And gladys is doing the best thing, giving lee st a good old clean out. Middle managers out the door by the trainload. And don’t try ‘loss of corporate memory’. Too much of the last 150 years doesn’t bear remembering. Railcorp is the same old SRA/PTC/NSWGR/Sydney Railway Company. Shields and his gauge was the least of the problems in 1855. The insolvency, leading to takeover by the state, was the real one! Gladys needs a medal, and if she keeps going so well, canonisation, like Alannah McT. I wish I could say the women have the gift of transport ministering, but Lynne Kosky, Anastasia P and Dianne Laidlaw didn’t do te team any favours. I think it is unfortunate that disabling the DDs is one of the few tactics available to prevent the legacy railway from retaliating. 25kvac would also have worked but would have been unnecessary in terms of vehicle weight/complexity. It is not unprecedented. QR has famously protected its patch from NCP for so long by its gauge. Economies of scale of network operability are overrated. Any good passenger railway should be integrated at the route level, with dedicated trains, depot, staff, and performance measurement for the route. Network integration in planning, timetabling and ticketing is sufficient. Where are Chris Corrigan and Peter Reith when you need them? Interesting comments Riccardo. My personal approach would be to clean out Railcorp before building any new lines. The Garry Glazebrook report put the costs of the various options at 47c/pax-km rail, 57c/pax-km bus and 80c/pax-km car. The difference between the 47c and 57c is hardly worth thinking about, and certainly not worth sacrificing long term productivity to achieve it. It’s as though the thinking is Railcorp is so broken that no possible move could ever fix it up. The problem is that reform of Railcorp won’t win votes, but might lose some. The real issue is why is the 47c/pax-km so expensive? One small correction – you and Sandy actually agree on the point about the driverless trains. One bigger correction – 25kV AC would NOT prevent Railcorp from operating trains in the new tunnels. The Milleniums were actually built with this technology in mind. There is no issue with having dual voltage trains. Get with the 1970s. RATP (France) may do well with double deck, but they do have longer carriages and (I presume) straighter platforms. I’d hate to see one of those trains stop at Wollstonecraft and the middle doors open. So to sum up, my personal point of view is that no railways should be built in Sydney until they can get the existing system working properly, and I’m certainly prepared to privatise it to achieve that. The SWRL I’m prepared to make an exception for, but even that is being built for a disgraceful price tag – more than the entire Mandurah line. The ridiculous 4 flyovers at Glenfield are probably a small part of the reason. I don’t understand why the bureaucracy seems obsessed with single deck to Hurstville. Remove that aspect, bring back the inner west to go single deck and the plan starts to make some sense. If there is ever a budget for it. Riccardo, your comments are absurd and you are totally out of line with the majority of independent transport experts. You demonstrate that you are nothing but an apologist for the government line. Your comments are not very credible.